It looks like a police patrol car, but it would be more convincing if it still had a light bar on the roof. 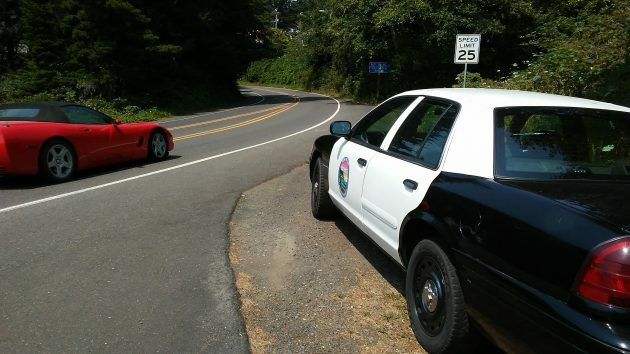 This is one way — the cheap way, if an old Crown Vic’s price is considered cheap — for little towns to encourage compliance with speed zones on Oregon highways. But the best way? Probably not. Cities everywhere are trying to reduce speeding. The town of Yachats parked an old black-and-white on Highway 101 at the southern entrance to the 25-mph zone in the business district. Did it work? Not consistently, as far as I could tell on Thursday. Millersburg, another small Oregon town without a police force of its own, might consider a different approach, judging by the agenda of the city council meeting on Aug. 8. “Plan for placement of radar speed signs on city roadways and financial related considerations.” That’s one of the items about which the agenda says Mayor Jim Lepin plans to talk. Albany used to get complaints about motorists far exceeding the 40-mph speed limit on Spring Hill Drive coming into town. Benton County put up a couple of those radar signs last year, and according to all accounts, and as I saw one evening, they proved effective. The radar signs tell drivers how fast they are going. They flash at speeders and are hard to ignore. Most drivers slow down right away if the sign tells them they’re going too fast. In Medford, radar signs are backed up with enforcement, meaning radar-activated cameras that catch speeders. Just watch drivers slow down when the sign flashes that they’re going 35 in the 30-mph zone of West Main. The radar signs on Spring Hill cost between $10,000 and $11,000 to purchase and install, I was told at the time. According to the online ads, you can get a used Crown Victoria Police Interceptor for between $7,000 and $8,000 and park it by the side of the road. Thank you for that report. On a tangentially related item – have you, or has anyone else, picked up on the Albany Urban Myth currently crisis-crossing Our Fair City at digital speed. The word is, Heritage Mall has successfully rented 300-spaces in its parking lot to eclipse fans at $1000.00/night with a 3-night minimum. I trust Hasso can either validate or debunk this urban myth in time for the blessed event. Yes, I speak of the Carousel Grand Opening. Heritage Mall is advertising tickets for RVs to camp in the parking lot for $150. As of Friday morning, 61 spaces were left. The tickets are good for the period from 1 p.m. Saturday, Aug. 19, to 1 p.m. Monday, Aug. 21. See the details here. From the dearth of comments on your missive, one can only conclude that the bulk of your fan base is out searching for an Open Cooling Center. Starting with the generation of the 80s there seems to have been a growing sense of contempt for law. I believe it’s due to non-enforcement as well as the lack of teaching of ethical behavior in homes and schools. That’s where it has to change. Until then, radar ticketing is a great way to punish non-compliance and emphasize that there’s a price one has to pay for ignoring traffic laws. The 80s, indeed. A lost decade populated by an even more lost generation of deviants, miscreants and cretins. Unfortunately,the BabyBoomers inherited almost no character from the Greatest Generation. The Boomers then went on to spawn the Gen X disaster. The question that always goes begging in these discussions is: what was so godawful about the way your parents raised you that would cause you to raise your spawn in such a negligent manner? Why was it that when your parents, either by design or by accident, taught you that your INDEPENDENCE is important. That you would have the training to balance a bank account and change your sheets and wash a dish now and then…is that too much to ask? Alas, we now live in a world where artifice is sufficient. Cars slow down for the first one or two times when the Crown Vic Black & White is parked roadside, but soon the magic wears off. No…the moving digital Big Screen speedometer readout of how fast you are going is much more motivational…rather like a slot machine. At least this example is a real “car” unlike that painted one on the side of that Sweet Home building. I assume the painted cop car & officer is still there. Used to make me chuckle. The problem will solve itself in a couple decades. Autonomous (self-driving) and semi-autonomous cars will maintain safe speeds and distances for every little stretch of road. They will also diminish the need for ruinously expensive road-widening projects. Dinosaurmobiles will be eased off the road by ever-increasing insurance cost extras. Almost all of the many recent traffic deaths around here would have been prevented by computer control.